Silvertone King Dex Romweber is hitting the road with a few dates in the Eastern US with his sister Sara on drums, and some guests from Norway, Orbo and the Longshots, a rockin' bunch currently in the Top 20 of the Americana charts. I spoke to him last night to see if he'd be taking his 1448 on the road with him. 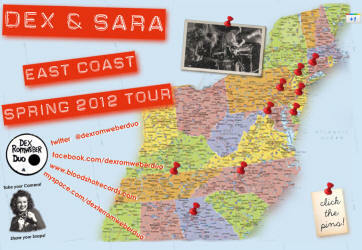 It was damaged just before Dex & Sara hit the road last year for the big Dex Romweber Duo cross-country tour, and he had to bring in his Danelectro re-issue two-pickup guitar to take care of the onstage six-string duties. I've seen the 1448 onstage recently, and wondered if he'd be bringing ol' Number 13 out on the road. "We're gettin' geared up to go, it's gonna be a good tour, for sure. I've been using the re-issue (two-pickup Dano), but I am taking the '63 (1448)... more as a backup because the thing's getting so old and gnarly, but I'm missing it, and last night I was thinking about it and I wanted to maybe soup it up for the main part of the show, and I'm not sure what I'm gonna do, but I am taking it." Head over to the Spring Tour Page to get venue/show info and to keep tabs on the tour with photos and video. 'Aristocrat' pages done? Check. 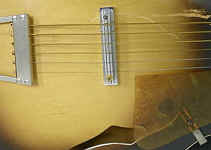 Popular '60s archtop 619 family page done? Check. 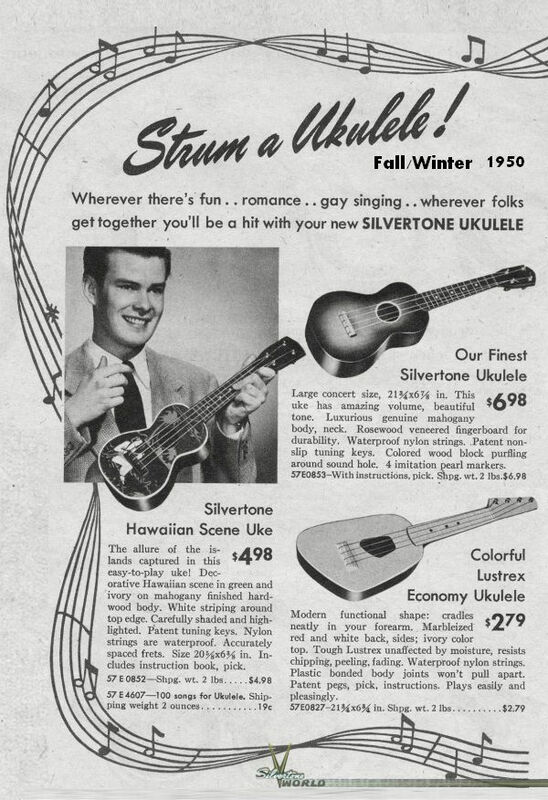 Alright, Silvertonians... next up in our pursuit of Every Silvertone Ever™ is the Danelectro guitar family. 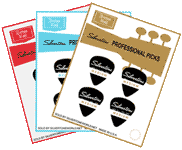 We've already got several up, but we're gonna finish out the entire family, revamp existing pages and get all the Dano-built guitar goodness allowed by law online here for you at Silvertone World. 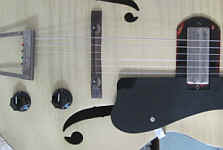 The very popular archtop acoustic, the 619 (and its nearly indistinguishable predecessor the 627 and blonde partners the 618 and 630) now have a page up, chock full of photos, info and catalog listings. 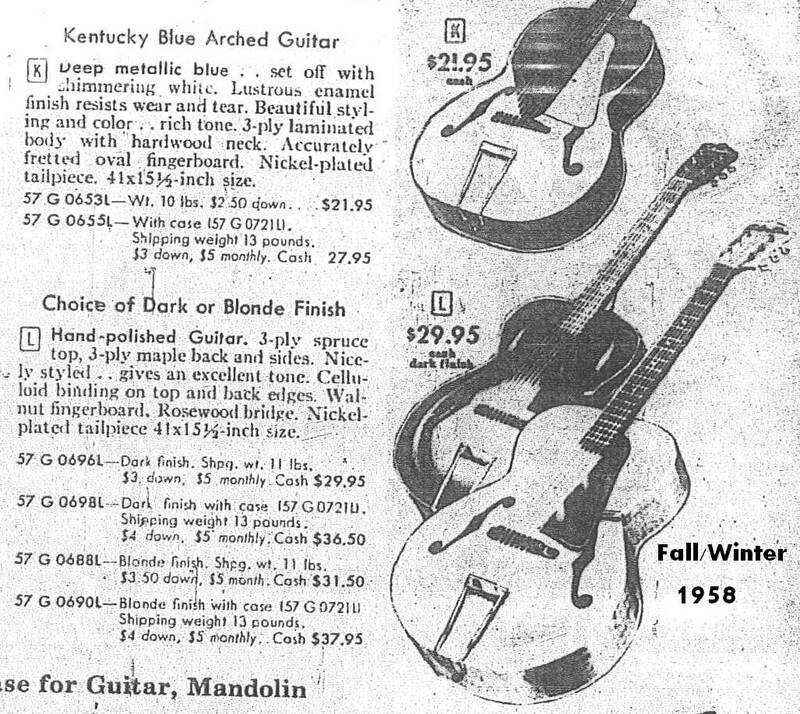 Available for nearly a decade, it was certainly the biggest-selling archtop series Sears ever offered. Go! Now! Since completing the 'Aristocrat' family pages, I've seen a few nice ones come in over the auction line, and here's a pretty blonde 642 from earlier in the week. The Kay-built 'Aristocrat' family is now complete! 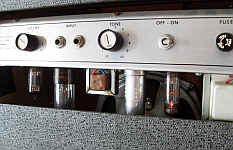 View the entire electric and acoustic families at the links provided. 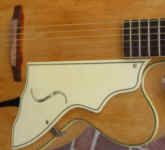 Work has commenced and is nearly complete on the page for the popular Kay-built archtop, the 619. Done!. Go! 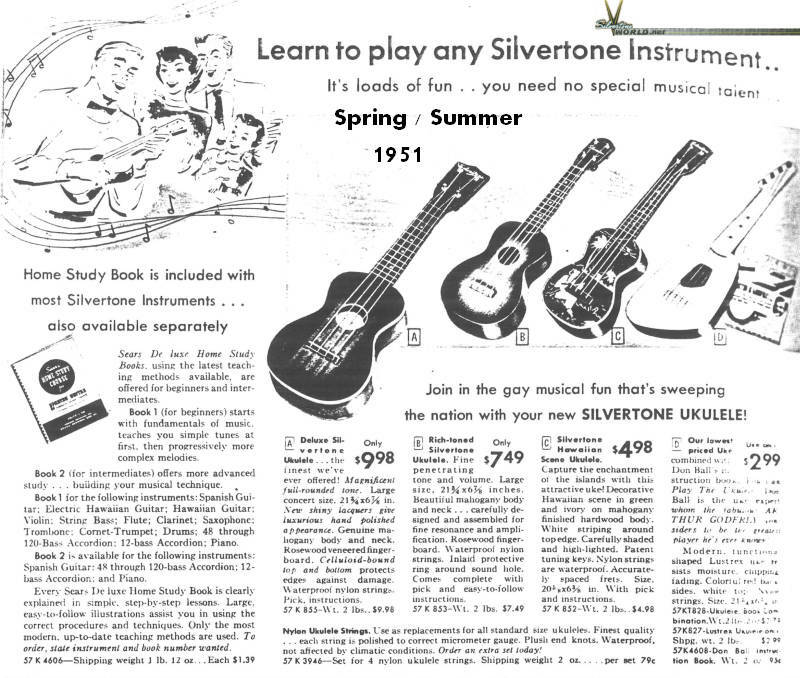 Funny how the ebb and flow of Silvertone World unfolds in its own time, in our time, so many years after our favorite instruments were retired from retail. 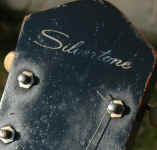 This is popular, this goes for a song, then that is popular and something else goes cheap... it's all about the moment, and we try and keep tabs on Silvertone World as if it were (and I really think is) it own little microcosm, with things to explore and discoveries yet to be made; a real... well, world. 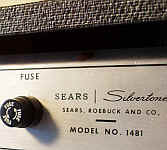 For instance, right now, these 1454s seem to be a 'hot' gee-tar. Dan Auerbach's (of The Black Keys) influence? Probably. He frequently plays the Harmony H78 that the 1454 is based on. 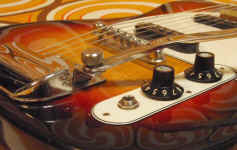 That and, well, they're great guitars! 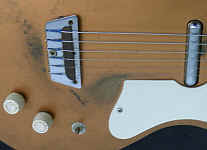 1454 Harmony HBEG w/ OC E $1199 Clean, minimal wear, logo strong, Bigsby intact, seller says "The guitar appears to have not been played a whole lot." The 1446 'Chris Isaak' never seems to go out of favor, even in 'meh' shape. Then, there is sadness... poor baby... still brought a decent price, though. You know I LOVE the original boxes... So, I was super-happy to see not only a relatively rare axe in the 604-related 606, but also in great shape, with the original box, how to play chart, record, paperwork and receipt! $18.67 took it home from the Sears in South Dakota.... went for a little more on the auction block! 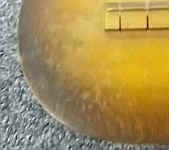 606 Harmony FTAC E $125 Clean, minimal wear, logo strong, orig. 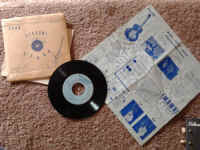 box, chart/record and receipt incl. 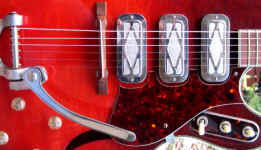 The rare 'C' body shape double-pickup'd 1360 in the even rarer 'flame red and black' finish! Terrific refinish on this 1477, they even got a nice 'thin script' logo for the headstock! 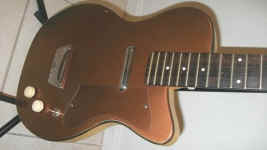 One of the best of this Tele™ clone that I've seen! 1413 Univox SBEG E $249 Clean, minimal wear, whammy present, prismatic 'Space Dot' looks good, original gig bag incl. 1327 Harmony SSEG MOD $575 Refinished, here's the story: "This thing is so much a part of me now, it feels like I'm about to write my profile for a dating site. ~deep breath~ Here goes...Chip in corner of original pick guard, nicks and dings around the outside but front & back are beautiful. 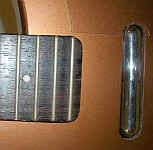 I was told it's a 1327 that was played until the fingerboard was worn practically through to the neck and destined to be refinished to the original faded sunburst (i.e. "shaded walnut" it was originally). 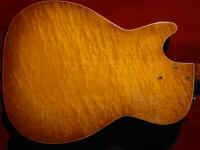 During the process it was revealed that the wood the body was made of was too beautiful to hide behind a darker finished burst so a honey burst was the ticket. Also, the neck couldn't be saved so another was fitted to the piece and it practically plays itself the action is so low - oh! and it's got a truss rod ta boot! 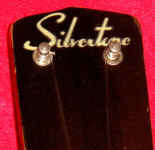 Don't forget to have a look at the handpainted "Silvertone" logo too, which I happen to love. The neck is definitely of a more modern taper design and has a scale length of 25" and a nut width of 1.712 measured via dial caliper. Needs one of those tapered plastic strap pegs for the rear. 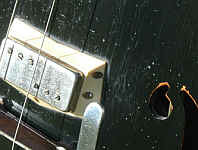 The bridge hole is slightly off center in relation to the strap peg hole and you might be able to see this in the pics. 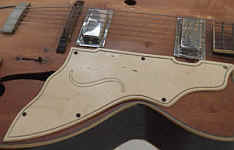 I'm assuming the strap peg hole was commonly drilled prior to the all important alignment of the tailpiece/bridge resulting in slight centering issues that essentially affect nothing beyond the ability to hold the strap peg more securely so it shouldn't be an issue. 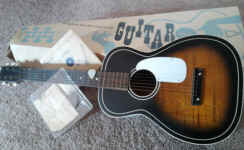 Never needed one myself because when this baby wasn't in it's stand, it was in my lap helping me figure out a new songs. Appears that this piece hung by it's headstock flares for a time before knowing me and endured some marking as well as color transfer from whatever the hanger was made of (see pics). Never bothered me so I didn't do anything about it. 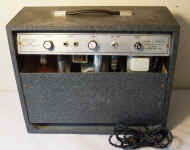 Looks like everything else is original right down to the screws & electrics and if you've never heard one of these fired up through a tube amp before you're really missin' out. For those that aren't aware, these are hollow so you can let um hang on your shoulder through an all night gig if need be without adverse affect OR pain killers." 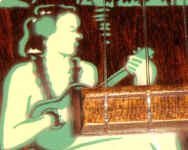 Here's a fine 'Wahini Uke' that sold for a nice price the other day, and I especially wanted to show you a neat detail in the actual silkscreen on top. I don't usually see such a nice close-up of the area, and thought you might be interested. 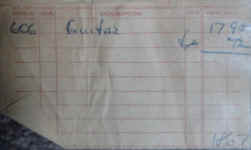 Note how the design was masked to have no ink where the bridge goes. 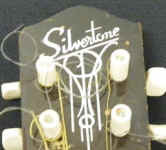 The Silvertone Aristocracy is nearly complete! Join family members 674 and 676 for a meet and greet. Here's a 'new math' word problem: Skinny 'C' style body + cupcake knobs = 1317! After I get the Aristocrats finished (I'm almost there!) 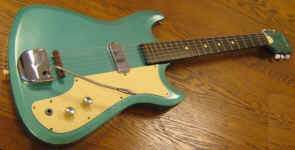 my next two projects will be to get the Kay-built acoustic 619 online and then the entire Dano-built family up and running. 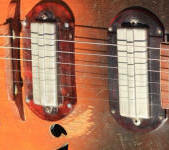 The 619 was a very popular guitar and turns up almost daily at online auctions. 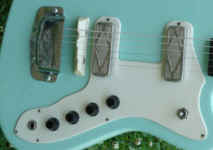 The Danelectro-built series of electrics is wide-ranging and varied, and once we get all the models up, we'll all know the difference between a 1300 and a 1321 (in this case, it's the body width: 11.25" vs. 13.25", the knobs: 'cupcake' vs. smooth, line-marker'd concave-topped, and the pickguard: clear vs. white). 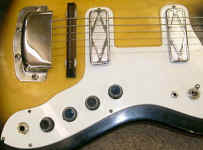 1300 Dano SSEG VG $525 Clean, light wear, logo strong, playing wear to neck, numbers painted on fretboard, cavity stamping indicates early 1958 build, mis-ID'd as a 1321 model. Well, whaddaya know... here's a 619! This is a later-era model that actually has a useful model stamping right inside! 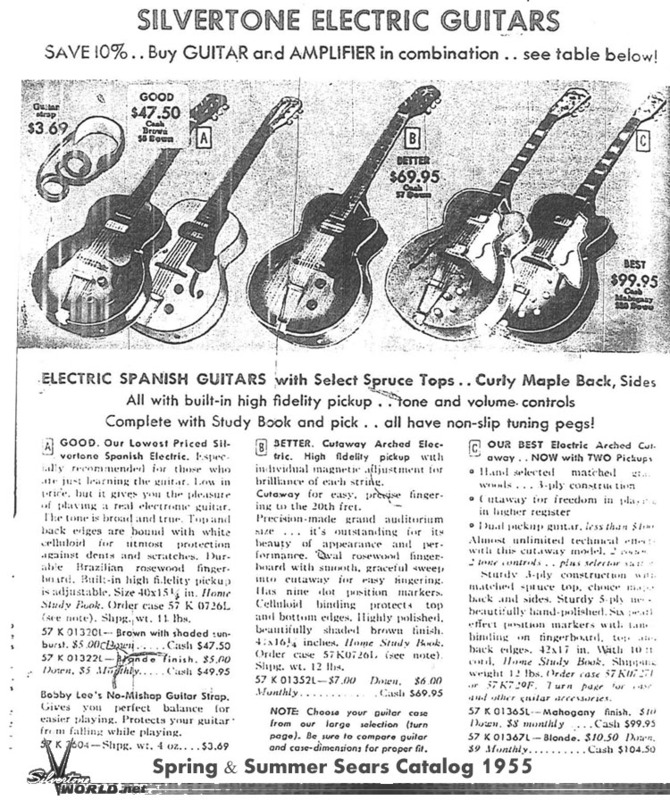 By the way, the number 57 was the Sears department number for musical instruments. This 1950s-era Kay model comes along every now and then, and this one is in pretty good shape. Those 'string keepers' are something I've never seen before, though. This Just In.... it's the so-rare-I'm-not-sure-I've-ever-seen-one 1375 and 1376 page just up. Go! Visit! Peruse! Ruminate! Some MODs are diamonds, some MODs are stones... Well, this one is a sparkler, for sure. I've always wondered why a production model like this one was never offered, and it's entirely possible this was a custom order from the Harmony factory. 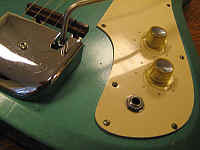 It's really a classy job; from the old-school extra knobs to the P13 pickup to the cut of the mounting ring and selector switch bezel. 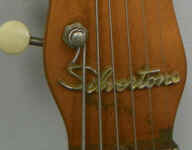 I imagine if this was a custom Harmony-accomplished job that the selector switch topper was a user addition, but it was added a long time ago, or a very old piece was found.... I mean, look at the age mellowing on the die! Great job, and certainly worth the money for the mod and the mojo! Here are a couple more exceptional Silvertones to come across the wire from the weekend. 1417 Kay SBEG VG $445 Clean, light wear, NS whammy bar, logo strong, pickup cover 'arrow' silkscreen worn, weird finish streaks on headstock, original gig bag incl. "This is one time where television really fails to capture the true excitement of a large squirrel predicting the weather." Bill Murray as Phil Connors in "Groundhog Day." I love that movie! There are those who says he spent over 33 years trapped in Punxsutawney. Happy February! Well, seeing as I'm concentrating on getting lots of new pages up (click every word back there; you'll get a new different 'Aristocrat' page), I don't have a money total for this month. 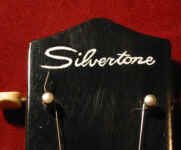 As I detailed last month in a few posts, I'm gonna curtail daily everythingthatgetssoldonebay reporting in favor of daily 'highlights' and spend lots of time getting Every Silvertone Ever up here on the site. 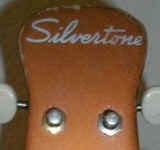 Viva Silvertone! If you haven't visited January 2012, give it a look... it was QUITE a month! 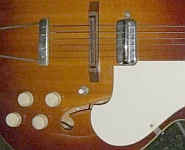 Here's a nice early '600 series' Harmony-built Silvertone; I like the well-rounded 'Jumbo' look! 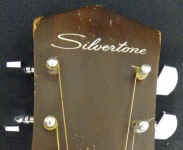 This was the first guitar in this long-running series, and the first Silvertone guitar to sell on eBay for February 2012. 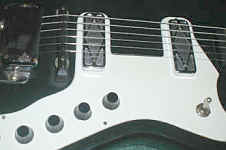 There was actually a predecessor, the 608, but it had a black pickguard. 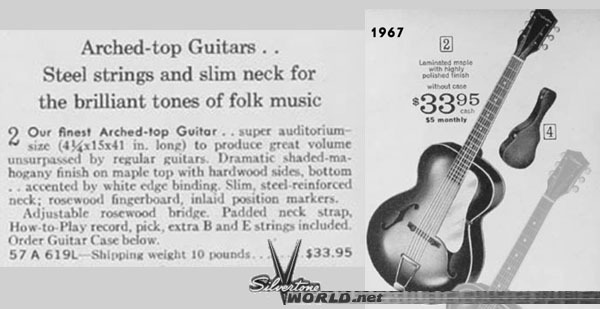 The 608 is quite rare, and here's a Silvertone World Exclusive: it was Roy Clark's first guitar! I'm working on a page for it; look for it soon. Here's the one and only 608 I've seen. Got one? Send me some pictures!